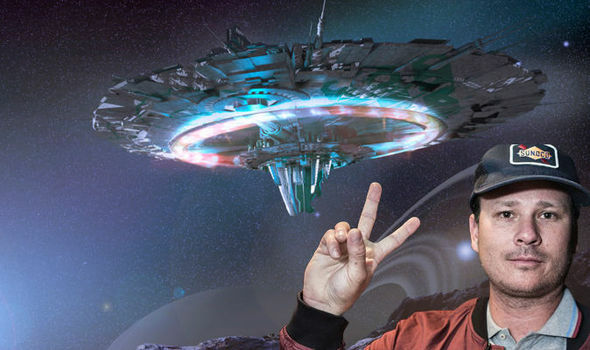 A couple of days ago we brought you the news that former Blink 182 guitarist Tom DeLonge was going to be making a big announcement about UFOs and aliens very very soon and we expected it to be completely bonkers and after it dropped yesterday, it turns out we were completely right. Streaming via his company To The Stars, DeLonge appeared last night talking about his plans for the future and just what he had been preparing for the last two years . The stream got off to a great start when it began without any sound for a good few minutes – a fantastic introduction to a company that is supposedly pushing the boundaries of new technology – but surprisingly the whole thing managed to deteriorate even further after that. OK, so the crux of the project is that Tom has rounded up a bunch of ex government officials that have been involved in new technology research and is now planning to build a UFO with them, but needs you to invest in it otherwise the project will be shut down by shadowy unknown forces. The pitch is that it has to be publicly owned through your investment as there’s no way that a private company would let this kind of technology fall into the hands of the general public, but it kind of came across as a beg for money from people who were already rich but didn’t want to spend their own money on their ridiculously expensive (and just plain ridiculous) hobby. Either that or he’s looking to start a cult that is similar to Scientology where you have to pay your way through the ranking system. I might eat my words in a few years when DeLonge and his buddies – and you if you invest! – are flying around in vehicles that ‘engineer Space-Time itself’ but for now I’m calling this for what it looks like: a complete and utter joke from a man who may be certifiably insane. Sometimes you gotta call a spade a spade. What a joke, but I suppose we don’t really expect anything less from DeLonge these days. Maybe he should have stuck to Blink 182 – although judging by his performance at Reading Festival a few years ago, he was pretty terrible at that too.